Oatmeal is one of the most common and popular breakfast choices for Americans. It’s comforting, filling and delicious. This recipe for oatmeal skips the grains altogether which is an added plus for those looking to avoid them. Instead delicious sweet fruit is used to mimic the consistency and comfort of oatmeal, with the added bonus of a ton of healing properties from the fruit. This is a quick and easy to make recipe perfect for both adults and children. This recipe is enough for one adult as a light breakfast or as a snack. You can double or even triple the recipe if you like if you are hungry. And with an oatmeal as nourishing like this, you can enjoy it any time of day! Place the bananas, apple, and cinnamon in a food processor and pulse until chunky and creamy. 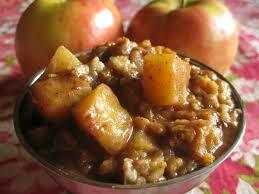 Transfer the mixture to a bowl and top with raisins, cinnamon and/or chopped apples. You can also add fresh berries, chopped pears or any other fruit of choice. 1 Spray 3 1/2- to 4-quart slow cooker with cooking spray. In slow cooker, mix all ingredients. 2 Cover; cook on Low heat setting 6 to 8 hours. Serve porridge with brown sugar and milk or cream, as desired.